Photo sensors are used to activate / deactivate electronic circuits. The most common Photo sensors used are IR sensor modules . These devices are designed to receive Pulsed Infrared rays from the IR diode from remote handset. Photo modules are used in TV, CD player, FM receivers etc to control the functions. By pressing each button of the remote, it is possible to emit IR of a particular frequency and the Photo module senses these pulsed IR rays to change the activity of the device. 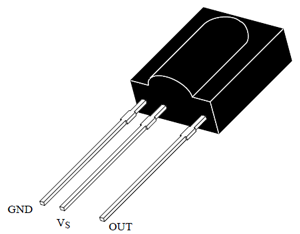 TSOP 17… Series Photomodules are excellent Infrared sensors for remote control applications. These IR sensors are designed for improved shielding against electrical field disturbances.